If you plan to cook or eat steak, in all likelihood, you want the most flavor and you want a juicy piece of steak. If that is the case, then the best way to cook a steak is medium rare. People may disagree and favor a rare or medium steak. Both are legitimate choices but are not the optimal way to enjoy a steak. 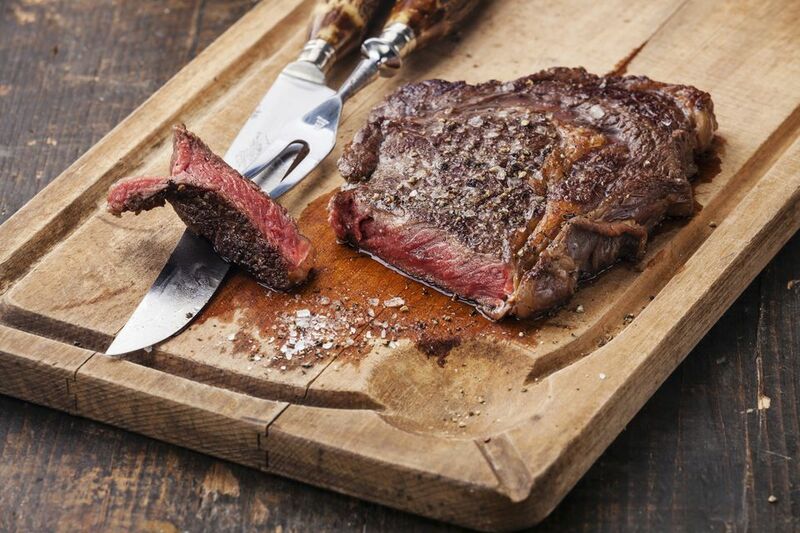 Why Are Medium-Rare Steaks Best? The longer you cook a steak, the tougher and drier it gets. For example, cooking a steak anywhere past medium, like medium-well or well-done, is a practice that should be thoroughly discouraged. These steaks are like eating leather. Medium-rare steaks give you the maximum amount of tenderness and juiciness while ensuring that the center of the steak is warm. The interior of a medium-rare steak will be mostly pink with just a tiny bit of red in the center, and the interior temperature is between 130 F and 140 F.
Steak doneness all comes down to temperature. Indeed, one of the defining characteristics of a rare steak, as opposed to medium-rare, is that it is noticeably cool in the middle. That is why the interior of a rare steak stays red. Beyond the fact that it is not so pleasant to stick a forkful of cold steak into your mouth, another issue with rare steaks is that the fat in the meat does not get a chance to melt and turn into little pools of flavor. It is the marbling, or the little flecks of fat within the meat, that imparts much of a steak's flavor and determines the quality of a steak. More marbling means a higher quality steak. So steak cooked rare is extra tender and juicy, but slightly cool and not as flavorful. That is a tradeoff some people might reasonably be willing to make. To cook a steak rare, you would cook it for just a minute or two per side, depending on thickness and how hot your grill is. The interior will be bright red and about 120 F to 130 F.
The inside of a medium steak is mostly gray with a small amount of pink at the center and no red. If you are throwing a grill party and you are not sure how your guests like their steaks, medium is a good middle ground. Those who prefer medium rare will only be mildly disappointed, while those who like it cooked more can always throw it back on the grill. Medium steaks are cooked to an interior temperature of about 140 F to 150 F.
So it is clear that interior temperatures determine each level of steak doneness. But, here's the rub, in no way should you stick a thermometer into your steak to see if it is done. If you do that, you will let all the juices drain out through the hole you just poked. The same goes for cutting into a steak with a knife to see what color it is. Refrain from doing either of these things entirely. Instead, you can tell how done a steak is by pressing the center of it with your finger. For example, you have grilled the steak for three minutes, flipped it over and grilled it another two minutes. With the steak still on the grill, press your finger into the center of the steak. If your finger sinks in and the steak feels soft or mushy, it is not done yet. Give it another minute. If the steak gives just a little bit when pressed and springs right back, that is medium rare. If it does not give at all or feels firm or hard, that is medium or beyond. It may take some practice to be able to identify the springiness in cooked steaks, but it is not that difficult. Just remember that medium-rare steaks will give just slightly and spring back when pressed.